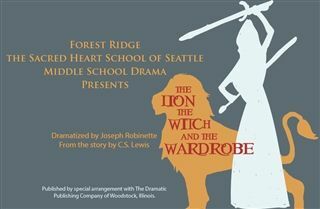 The Forest Ridge Middle School Drama group will present "The Lion, the Witch, and the Wardrobe" on Friday, December 14 at 7:00 p.m. and on Saturday, December 15 at 2:00 p.m. and 7:00 p.m. in the Lee Theater on the Forest Ridge campus. Tickets are $8 for students and senior citizens, $12 for general admission. Faculty and staff are admitted free of charge.